Quality service, we’ll put our name on it! Why Bellman Plumbing? 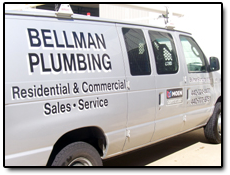 Bellman Plumbing has been Northeast Ohio's #1 plumbing contractor since 1955. We are family owned and operated, with a staff of the most experienced plumbers this industry has to offer. Our employees truly are the best of the best! The average experience of a Bellman Plumbing employee is 25 years. We don't send novices to your home or construction project. Our strength lies in our knowledgeable staff, and organization. We specialize in home repairs, residential and commercial remodel, residential new construction, large commercial new construction, and so much more. Our philosophy is Honesty, Integrity, and Hard work. This has been the core belief of my Grandfather Max Bellman, passed on to my Father Robert Bellman, and embossed in my moral code. So give us a call, and let us satisfy your plumbing needs. Copyright © 2012. All Rights Reserved. Powered by InUnison LTD.